The St. Peter’s Basilica Holy Door is opened only once every 50 years, on the first day of the Holy Year (Jubilee Year). The pope strikes the brick wall with a hammer and then opens the door to let in the pilgrims. At the end of the Jubilee Year, the pope closes the door. The tradition of the opening and closing of the Holy door can be traced back as far as the 15th century. Above St. Peter’s Basilica Holy Door are two marble memorial plates commemorating the last two times when the door was opened. Pope John Paul II opened the door during the last two celebrations of the Jubilee Year, therefore the plates show that the door was opened and closed by him. The St. Peter’s Basilica Holy Door was closed last on January 6, 2001. 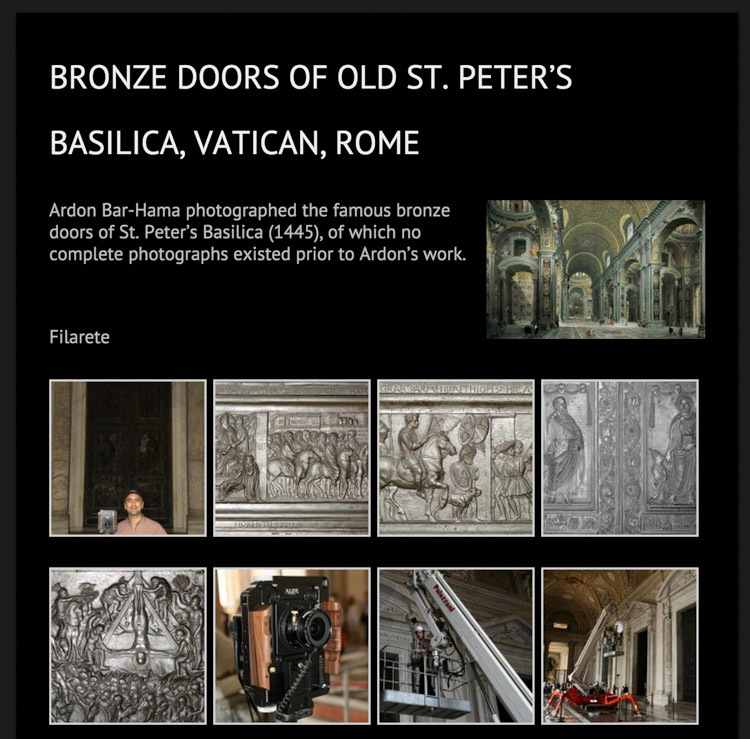 In 2005, shortly after Ardon Bar-Hama met Pope John Paul II, he was invited by the Vatican to take the first complete photographs of the famous bronze doors of St. Peter’s Basilica. In order to reach the top of the 14-foot doors, cherry pickers were used to get close enough to photograph all the details of the doors. The extremely high resolution images allow you to examine each intricate element. Pictures from the photo shoot at the Vatican can be viewed here.